There is often to cut a concrete block. However, it is difficult to cut a concrete block finely. Since I devise and am cutting well using a diamond cutter and a concrete drill, I introduce it. A disk grinder and diamond cutter cut a concrete block. 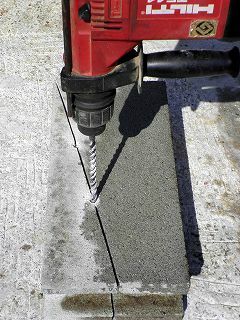 A concrete block can be cut if a disk grinder and a diamond cutter are used. However, the cutting thickness of a concrete block is less than about 30 mm. 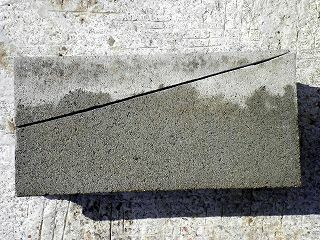 When cutting a concrete block like this photograph, a block cannot be separated without the ability to cut only the surface. In order to have separated this until now, the concrete block was struck using the hammer, but it cannot cut well. In addition, when using a diamond cutter, in those who used by the wet type, the edge of a diamond cutter withstands long use also with the edge it is written that can use by dry type, pouring water. This is because the diamond is weak with heat. Moreover, it can prevent sprinkling particulates by pouring water. It also becomes prevention of a black lung. The hole is made in the concrete block after cut with the diamond cutter. Then, the hole was made in the portion from which the concrete block cut with the diamond cutter is not cut with the concrete drill. When several places or a hole was made little by little using the Φ6-8mm drill bit, it dissociated automatically and was divided well. The portion from which an ordinary concrete block cannot be cut four places like the photograph under this remains. A hole is made little by little in this portion from both sides of a concrete block. This photograph uses TE-22 of Hilty for the drill. This hammer drill is a gadget which can make a hole in concrete by no reacting. This photograph is the cut concrete block. It arranges in this way and uses for the ground stop of a slope. In this case, the angle of inclination of a slope will be about 14 degrees. 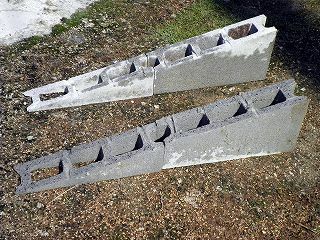 Thus, the cut concrete block does not have a useless portion and can make a slope easily. Of course, if this method is used, cutting in other forms is also possible. It is effective cutting of 12-cm block or 15-cm block. Since a 12-cm block and a 15-cm concrete block are thick, it cannot break only by a diamond cutter well at all. In this case, it seems that this method is especially effective.